During the Edo period (1615–1868), those who travelled from Kyoto in Western Japan to Edo (modern-day Tokyo) in Eastern Japan would typically use the Tōkaidō highway. Five miles into that journey, the travellers would reach Ōtsu, the first of the highway’s 53 stations. 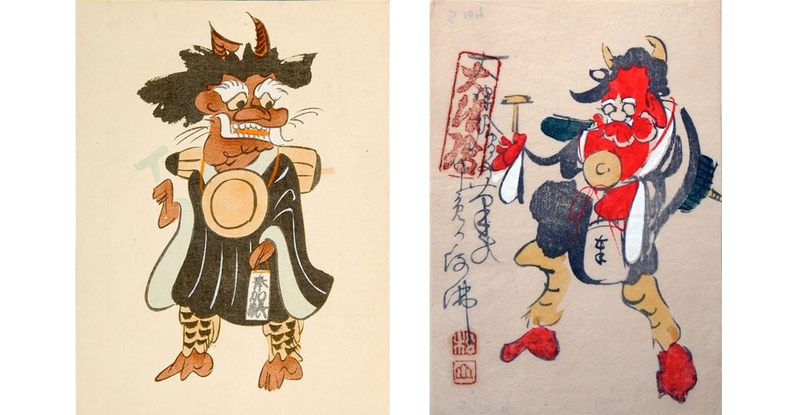 From the early 17th century, this locale was known for a unique folk painting tradition: Ōtsu-e (literally, “pictures from Ōtsu”). In his groundbreaking 1954 text The Floating World, James Michener described Ōtsu-e as the stylistic forefather of Japanese woodblock prints, an opinion that had been shared by eminent woodblock print designers in the Edo period, such as Utagawa Hiroshige (1797–1858), who made occasional references to Ōtsu-e in their works. Like many other forms of folk art, Ōtsu-e were traditionally produced by anonymous craftsmen and sold inexpensively as souvenirs. In the early 20th century, however, some artists developed international fame for their attempts to revitalize the genre. This rotation spotlights two such artists: Kusunose Nichinen (1888–1960), whose works will be displayed in the Robert F. Lange Foundation Gallery, and Takahashi Shōzan (b. 1932), whose prints will be exhibited in the alcove of the nearby Japan Gallery.